Laurent Pelly’s acclaimed production of Donizetti’s opera radiates tenderness, humour and southern sunshine, starring Vittorio Grigolo, Lucy Crowe and Bryn Terfel. Village boy Nemorino is besotted with the wealthy Adina. She rejects his declarations of love – but fortunately the quack Doctor Dulcamara is on hand with a ‘love potion’ to help him win her heart. Adina seems to remain immune to Dulcamara’s potion (nothing more magical than red wine) and agrees to marry the arrogant Sergeant Belcore. Luckily, at the last moment she realizes she really does love Nemorino. All rejoice – Dulcamara most of all, as he celebrates his potion’s proven power. L’elisir d’amore is one of the most loved of all Donizetti’s operas. It combines touching romance and hilarious comedy with beautiful music, including Nemorino’s enchanting aria ‘Una furtiva lagrima’. The opera’s premiere in Milan in 1832 was a triumph and secured Donizetti’s place as one of the leading Italian opera composers of his day. Donizetti deftly brings his characters alive with a sparkling score: Nemorino’s love for Adina is expressed through lyrical arias; Adina’s animated, flamboyant style softens as her feelings towards Nemorino begin to change – and all the while Dulcamara, irrepressible showman that he is, endlessly chatters away. 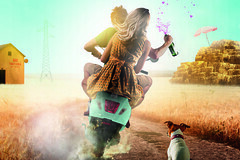 The Royal Opera’s charming production is set in the sun-drenched countryside of 1950s Italy, complete with haystacks, Vespas and even a stray dog. It is injected with lively, visual humour – from Nemorino’s tipsy clowning to Dulcamara’s lumbering truck from which he sells his quack remedies. 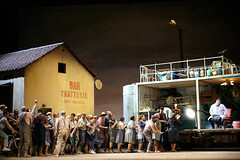 What did you think of the live cinema relay of Laurent Pelly's Royal Opera production of Donizetti's comedy? Laurent Pelly’s Royal Opera production stars Bryn Terfel, Vittorio Grigolo and Lucy Crowe. To find out more visit the L'elisir d'amore (2014) production page.